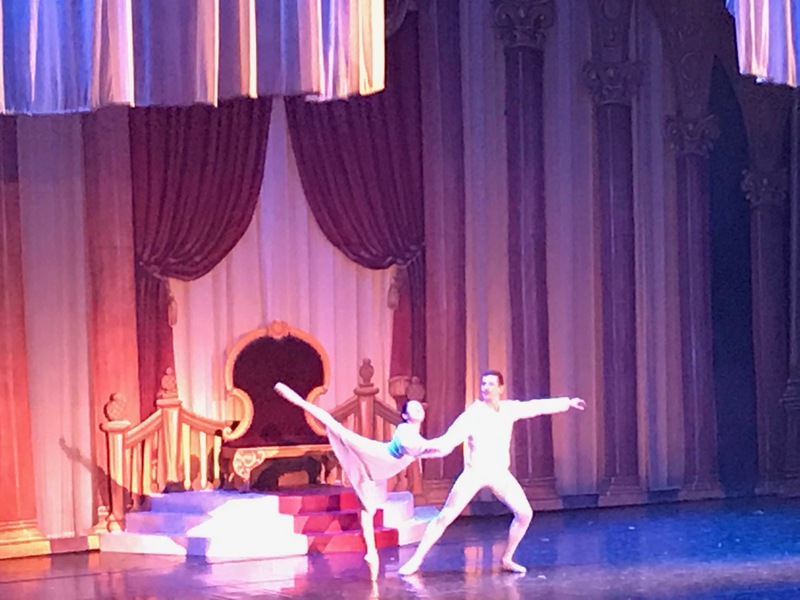 Last Saturday I went to the grand and historic San Gabriel Mission Playhouse to see “The Nutcracker” Ballet performed by the Pasadena Dance Theatre. It is a truly lovely production of a traditional Christmas favorite. “The Nutcracker” is a charming story about a girl’s dream on Christmas Eve. It opens with a splendid 19th century family Christmas party. A girl named Clara receives a present of a nutcracker doll from her mysterious uncle who is a magician. Her mischievous brother snatches the nutcracker away and breaks it. Clara cries, and her parents put her injured doll under the Christmas tree. After the grand party is over, the guests have gone, and the family has gone to bed, Clara sneaks back into the living room to check on her beloved nutcracker. Just at the stroke of midnight, the beautiful Christmas tree seems to grow bigger and bigger as Clara shrinks down to the size of her dolls. The Nutcracker comes to life and becomes a handsome prince. Suddenly, a group of huge mice appear and almost carry Clara off. The Nutcracker summons his army of toy soldiers to fight off the mice. In the fierce battle that ensues, the Mouseking fights sword to sword with the Nutcracker and almost wins until Clara throws her shoe at it. The startled Mouseking falls to the ground as the Nutcracker plunges his sword into his foe’s side. The grateful Nutcracker Prince takes Clara on a sleigh ride through a magical forest where Snowflake Fairies dance holding aloft twinkling lights. The Nutcracker Prince introduces Clara to the Sugarplum Fairy who crowns her with a tiara after the Prince does a dance describing how she saved him from the Mouseking. Then the Sugarplum Fairly treats the couple to a variety show including Spanish, Arabian, Chinese, and Russian dancers, plus a lady clown with a giant skirt out from which pop eight little ballerina children. The final dances are graceful duets where Clara dances with her Prince and the Sugarplum Fairy with her consort. The magician uncle then reappears, and Clara returns from her dream world as the Sugarplum Fairy and her subjects wave goodbye. I love this ballet. The sets are great, especially the magically growing Christmas tree, aglow with lights. My favorite dances are the energetic Russian trio, the colorful Waltz of the Flowers, and the spectacular Snowflake Fairies who leap so lightly that the lights they carry seem to float across the stage. “The Nutcracker” reminds me of “It’s a Small World” or the magic carpet ride that Aladdin takes Jasmine on, only this is the original thing instead of the cliche. And Tsaikovsky’s music is definitely the real deal — sorry, Disney. Long after the rest of the audience left, I sat there musing over the delightful dream world I had just visited, savoring the sights and sounds. This is a treat definitely worth enjoying that leaves you wishing for more. There is one weekend of performances left on Friday, Dec. 21 at 2 p.m, Saturday, Dec. 22 at 2 p.m., and Sunday, Dec. 23 at 1 p.m. The San Gabriel Mission Playhouse is located at 320 S. Mission Dr., San Gabriel. Tickets start at $50. To purchase tickets, call the Pasadena Dance Theatre at 626-683-3459, or visit the Playhouse Box Office on Tuesday or Thursday from noon to 6 p.m. If you can’t make it this year, don’t worry. “The Nutcracker” is an annual event, so you can go for it next year.